Lower back pain worsening over the past 10 years. Cervical pain, sternocleidomastoid (SCM), anterior scalene pain. Complaints of severe head pain which is progressing. Over the past 6 months patient has been in severe levels of pain with no resolution. Back pain is every day – chronic or sitting at a desk. Head aches present possible due to emotional stresses and awakens with soreness. TMJ clicking, but no pain. Pressure in the ears bilaterally mainly left. Physio-Therapy with pressure point myofacsial release in the left neck region that trigger pain to side of head. Chiropractors and physio therapy has been on going with not long term stability of posture and muscle strains. Physio therapy has been once a week. Medical history: no significant findings by physicians. Orofacial Pain classification: Axis 1, somatic(myofascial with overlaying neurovascular pains), Axis II, Anxiety disorders due to medical conditions. A comprehensive examination was completed which included review of medical/dental history, periodontal evaluation, musculoskeletal occlusal evaluation, ICAT imaging of TM joints, a complete kineseographic assessment (K7) work up (EMG, EMG and ESG) was done prior to muscle relaxation as well as after TENS. Both muscle palpation was accomplished to assess both subjective and objectively the patients concerns. Pre-existing conditions prior to treatment. A conservative and reversible orthotic therapy protocols was implemented based on a multi-dimensional assessment observing typical signature patterns confirming injury and hidden pathologies not typically visualized on cursory examination. The K7’s objective recordings and analysis was incorporated with the doctor Chan’s senses, exponentially enhancing his special visualization and conceptual grasps of the functioning or dysfunctioning body parts, organs, and neurovasomuscular systems, while utilizing to the fullest the physical findings from the clinical examination of this TMD paining patient. Awoke with absolutely no neck pain! Couldn’t finde pain spots. She could get out of the bed normally vs rolling out of the bed as usual. She could sleep on the side. Before on the side she was in pain. Notice in the mirror her smile was more normal. Easier to smile with the orthotic position. A relax smile. Husband noted she smiled comfortably and noticed that she was not having to be forced in a position. She would always smile with her teeth apart, but now she can smile with her teeth comfortably together. Her cervical pain is completely gone! Patient and husband are shocked how well she could speak…she was informed to talk slowly, but she finds no problem with speaking. Before treatment when chewing she had a lot of freeways space, but with the orthotic, she finds chewing more efficient. She noticed she had to fill up her mouth with more food due to excessive freeway space. Awakened with a mild temporalis head ache. Once patient was stable and free of pains, Nine (9) months later a Phase II orthodontics was initiated. Orthopedic verticalization techniques were implement using the GNM orthotic as the orthopedic matrix guide to growth and develop the lower posterior teeth upward to the new occlusal plane. Elastics were used to help bring the lower teeth upward to the corrected position. The K7 was used through the treatment to confirm and validate that the patients mandible was functioning and the orthodontics was being developed to the correct and optimized myo-trajectory. 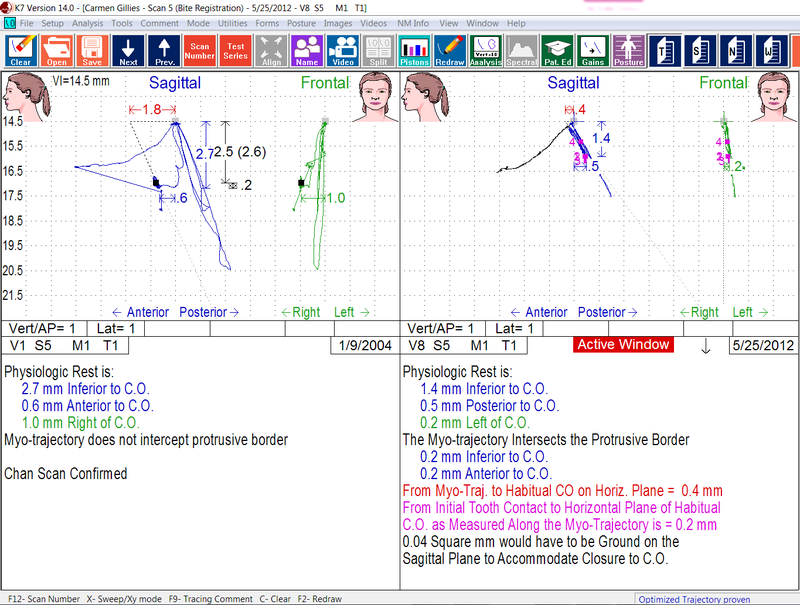 Below is the K7 sagittal and frontal jaw tracking scan that show the optimized myo-trajectory closing path of the lower jaw is not synchronized with the habitual closing path (no longer is there an antero-posterior discrepancy in the jaw) and patient is neuro-muscularly stable, and pain free. Case is not ready to move toward a Phase II restorative finishing stage to complete the cosmetics and finalize the gneuromuscular function. Orthodontics and orthopedic upper and lower arches were expanded and developed while simultaneously coordinating the vertical development of the new occlusal position. A provisional trial smile was tested to visualize the length of the proposed maxillary anterior vaneers. A further refinement of the occluion was discussed and presented. Left photo is occlusal marks with labial surfaces waxed to the existing natural dentition as an addition to enhance the worn naturally teeth was tested and the patient reported that the bite felt very good. TMD symptoms were no longer present. The right photos shows the improved gnathic occlusal marks molded on the diagnostic model and used as template to be reproduced via a matrix to provisionalize over the natural upper teeth as a provisional fixed bonded orthotic. These marks were installed into the mouth and tested for comfort and patient reported surprisingly that her bite felt even better and more stable then the previous balanced occlusal marks!! Specific “Bite Management” and occlusal management protocols are followed as per OC GNM teachings to coordinate the laboratory process with the patient’s optimized and proven bite/occlusal position. Tooth preparation day was arranged to conservatively shape the determined teeth, still preserving the enamel for laminated porcelain restorations based on the predetermined wax ups. Porcelain was skillfully crafted to the detailed specifications required by Dr. Clayton Chan for GNM dentistry. Occlusal view before and after upper fixed orthotic. Immediate occlusal marks before occlusal adjustments were detailed with J5 Myomonitor TENS and K7 jaw tracking. K7 Jaw tracking (Scan 4/5) confirms physiologic location dynamically in AP, frontal/lateral and vertical positions prior to proceed to final restorations. There is no slide. Patient’s TMD issues have been proven stable, pain free and off all medications. EMGs Before and After Treatment – Measures the quality of muscle rest during and after closure. 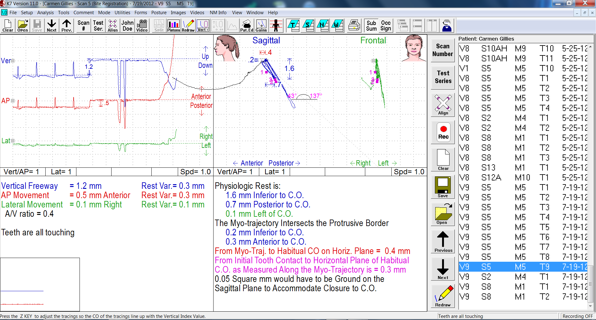 K7 Computerized mandibular scanning (CMS/ jaw tracking) measures quality of terminal closure to CO before and after optimized GNM occlusion and jaw position relative to mandibles physiologic rested position with Myomonitor TENS. Left window shows before treatment. CO position before treatment was 1.8 mm posterior to the optimized myo-trajectory. Right window shows CO position (new occlusal position) has been corrected where voluntary habitual closure is equal and coincident to involuntary closure. (This can only be verified and proven with TENS and jaw Tracking). CMS functional chewing patterns: Before and After GNM treatment. Note: Improved facial form, improved arch development, improved vertical and AP mandibular positioning, improved facial form. And no longer having TMD pain! This is GNM…. !